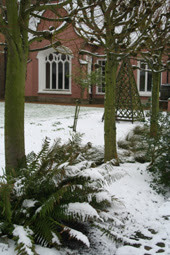 This month we had our first snowfall in Toddington. It had been exceptionally mild and wet before this, but unexpectedly one morning, we woke up to a crisp white blanket covering everything. Gardens always look so neat and clean under the snow, and there is little gardeners can do outside, but it is always worth checking no branches have snapped under the weight of the snow, and theres always the job of keeping the driveway and paths snow free! This photo show the woods behind the Manor, the main lawn in front of the house and the wonderful mature trees like the walnuts, ceder of lebanon, wellingtonias, silver lime and copper beech. The cricket square is at the bottom of the photo, as the grass is kept shorter here, it stands out against the longer outfield grass. 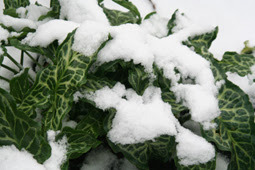 There a few plants braving the cold conditions of winter - the hardy ferns including dryopteris wallichiana, helleborus orientalis is almost blooming, and the marbled leaves of arum marmoratum are looking lovely. 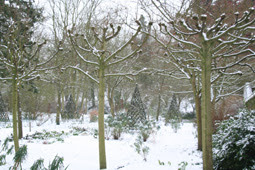 The structures in the garden such as the wooden obelisks in the main herbaceous borders stand out against the snow too. 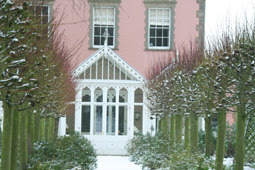 Our pleached are waiting patiently to be pruned back their knobbly knuckles, but look glorious against the pink manor and white snow. They are the red stemmed cultivar - tilia platyphyllos 'Rubra', so we like to leave the stems on as long as possible so providing interest during the long winter months.